In the lectionary, the Church’s schedule of Sunday readings, the Gospel for the Christmas Mass at Dawn and the one for today are the same — the shepherds arriving at the manger. But today one extra verse is added — Luke 2:21. It tells about Jesus receiving his name — the name given him by the angel announcing to Mary her special role. 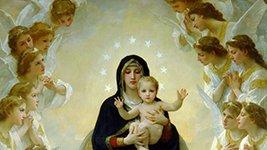 The angel had told her (Lk 1:32) that her son will be … the Son of the Most High … and of his kingdom there will be no end. So, by adding this verse today, our Church is reminding us that Jesus is divine, and therefore Mary is the mother of God, not only of the mother of the Jesus as human. Sounds simple, but that belief took about 400 years to put into words! It finally happened at the Council of Ephesus in 431 when Mary was given the title Theotokos — God bearer. We are supposed to be God bearers, too. The incarnation continues today in us. Share the Christ in you with someone today!